Are you looking for Adventure, or to just relax? Then come to where the Southern Alps meet the "Roaring Forties", base yourself in Tuatapere, on the famous 'Southern Scenic Route' and allow at least two days to explore some of the hidden treasures of the extreme southwest of New Zealand. Walk five minutes from town to see the 'Leviathans of the Forest' - thousand-year-old Totara trees! Wander along stunning Blue Cliffs Beach, just ten minutes drive away and formed by the wild storms spawned from the Great Southern Ocean and Antarctica. Enjoy the 'world famous' Tuatapere sausages from the butchers around the corner. You can even walk the Hump Ridge Track and visit the largest viaduct in the southern hemisphere. Welcome to Aunt Tui's where you'll feel like family or friends after even a night or two in this warm, comfortable and charming bach, which has everything you need for a relaxing or exciting holiday. It is private and well fenced so no worries if you're bringing pets or children and the large native garden is visited by tui, bellbirds and wood pigeons. Don't expect all mod cons when visiting Aunt Tui's, this house is very special and reflects the owners' interest in art and collecting. The decor is virtually unchanged from the time it was built with high timbered ceilings and open fires in the bedrooms. However, the beds are new and comfortable and will fit even the tallest visitor, one being “Californian King Size”! There is a 2nd double bedroom while the 3rd has a set of bunks for the adventurous and 2 singles. The sitting room is in the centre of the house and with an open fire complete with driftwood , a music collection that will take you back and comfy armchairs and couches, it makes for memorable evenings! Off the sitting room is the dining room which boasts an ancient refectory table that has seated up to 20! A small cosy kitchen with all the basics you'll need, leads through to the sun room which catches both sunrises and sunsets. A short drive to Te Waewae Bay, Giant Totara, Clifden Caves. Please smoke outside, thank you. Housed seven of us comfortably and warmly. Companionable and intriguing decor. Hidden Treasure in Tuatapere - Great for summer!!! Great getaway for the weekend, It's an older house but full of character !!! No need to visit a museum in Tuatapere as Aunt Tui's got it covered. The outdoor seating and back yard is a true bonus especially for little ones to play around. My advice is to arrive early and open the house up to let it breathe, she's a little musty but that added to the charm of the place plus the beds are super comfy! Thanks, Mary, we hope to visit again. It really is a step back in time staying at Aunt Tui's and very homely, with a lovely old style garden, and down a quiet street. 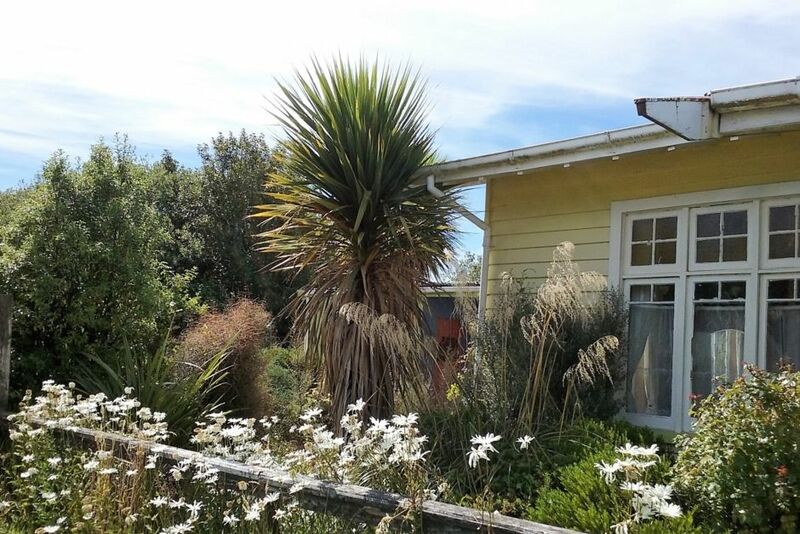 We had the best stay at Aunt Tui’s, the house is full of charm and interesting things. It is in the best position for all of Tuatapere’s amenities. We would have loved to stay longer and will be staying again in the future. Quiet, peaceful place close to everything. Lots to see and do in the area. We'll be back.